Right-wing militias and other antigovernment organizations have received heightened public attention since the Oklahoma City bombing. While such groups are often portrayed as marginal extremists, the values they espouse have influenced mainstream politics and culture far more than most Americans realize. 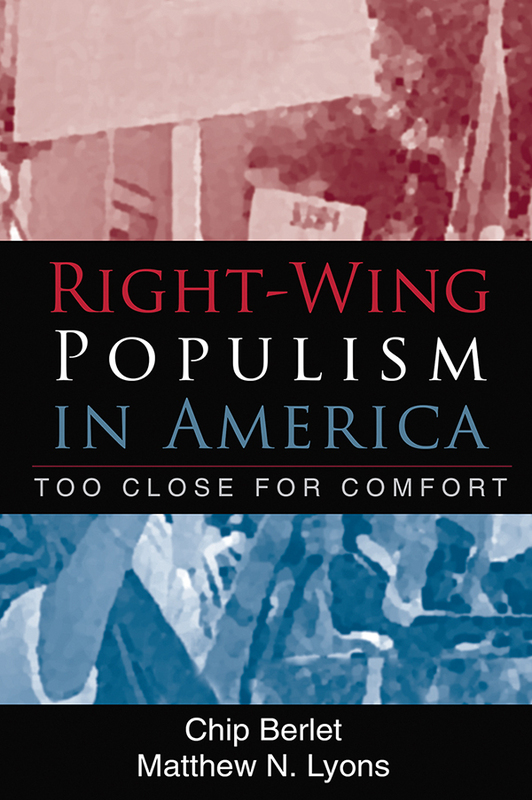 This important volume offers an in-depth look at the historical roots and current landscape of right-wing populism in the United States. Illuminated is the potent combination of anti-elitist rhetoric, conspiracy theories, and ethnic scapegoating that has fueled many political movements from the colonial period to the present day. The book examines the Jacksonians, the Ku Klux Klan, and a host of Cold War nationalist cliques, and relates them to the evolution of contemporary electoral campaigns of Patrick Buchanan, the militancy of the Posse Comitatus and the Christian Identity movement, and an array of millennial sects. Combining vivid description and incisive analysis, Berlet and Lyons show how large numbers of disaffected Americans have embraced right-wing populism in a misguided attempt to challenge power relationships in U.S. society. Highlighted are the dangers these groups pose for the future of our political system and the hope of progressive social change.